US, 2008, 90 minutes, Colour. Nick Cannon, Melonie Diaz, Matt O’ Leary, Tom Sizemore, April Grace. 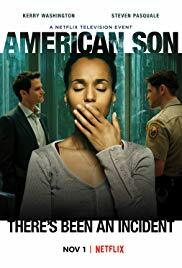 American Son is a brief film about a young African American marine who is about to be sent to Iraq. He has eight days’ leave and travels home to Bakersfield. He meets his mother and half-sister, his adoptive father (Tom Sizemore) and his real father with whom he has a bond. He meets a young woman on the bus (Melonie Diaz) and forms an attachment to her. He also meets his friend (Matt O’ Leary) who has stayed in Bakersfield, has a drug and employment problem, is partly envious of what has happened to the young man in joining the marines. The film shows the ups and downs and the emotional experiences of the young man as he revisits home. The prospect of fighting in Iraq and dying in Iraq is ever-present. Nick Cannon is strong in the central role and the supporting cast is very effective. 1. The impact of the film for an American audience? For the parent generation, for those who go to Iraq? For the younger generation? The memories of American involvements in overseas wars? Vietnam? 2. The time setting, ninety-six hours? The opening at the fort, the introduction to Mike? The other soldiers? Orders? His being given leave? The film indicating the hours passing? 3. The settings, the fort, travelling through the American countryside, Bakersfield and its surroundings? An ordinary American town? The musical background? 4. African American characters? Hispanic characters? The majority – and the minority of white characters? 5. Mike, as a person, his background, his being reliable, praise from his mother? His joining the marines? Jake telling him he should have encouraged him to join with him? His sense of integrity? Not telling the family and people in the town that he was going to Iraq? His uniform, spick and span? On the bus, moving to the seat with Christina, introducing himself, their talking? The bond between them? His meeting up in town, going to visit Christina’s family, their reactions to him? The outings with her, the dance, the group, his punching the man who escorted her away? His friendship with Jake, talk, playing basketball, the clashes, Jake’s erratic behaviour? His drugs, apartment, climbing up onto the roof? Mike telling him he was going to Iraq? Jake’s reactions? Mike and the motel, with Christina, finally telling her the truth, her being upset? The reconciliation? The visit to the old woman whose son had died, dressing up in his uniform? Going to see the young man who had his leg injured in Iraq? Their talk? Christina’s presence? His missing the party, his stepfather driving him to the bus station, the farewell to his mother, her accepting his going, her pride? Getting on the bus and the film ending? 6. Christina, her family, plans for college? Attraction towards Mike, sensible, questioning him, trying to understand him? Her family? The visit to the old lady? The visit to the injured soldier? Their time together, the sexual relationship, his telling her the truth, her being upset, accepting the truth? 7. Jake, staying in the town, not amounting to anything? The past bonds with Mike? The up and down of his moods? Playing basketball, getting the huff? The outing, the drinking? His apartment and drugs? Climbing up the tower and onto the roof? His response to Mike telling him the truth? Upset? 8. Mike’s visit to his actual father, the workplace, their discussions, the bonds, the mother saying that there had been good times in the past? The tension with his stepfather? 9. The background of people in the ordinary American town? The background of the military and the marines? 10. The situation in Iraq, the invasion, the American occupation, sending troops, the death toll? The impact of seeing this in this kind of film?